I was kindly lent this film from a friend at work after recently watched The Pianist again. Last week was 70years since the liberation of the Auschwitz concentration / extermination camp and it had occurred to me I should learn more about the Holocaust and to investigate humanity’s darkest chapter. 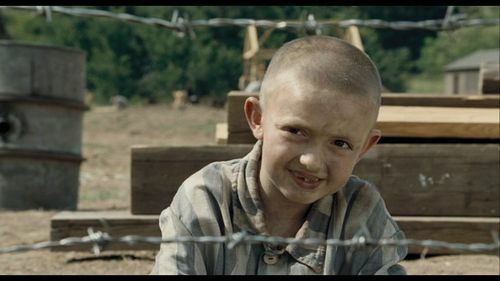 The Boy In Striped Pyjamas is a film that discovers the horrors of the camps through the eyes of a child. We learn more as Bruno, the main character does. Bruno is an eight year old German boy living in Berlin. The film begins as he is told the family have to leave Berlin as his father takes up a new job in the country. The father is a soldier, but Bruno discovers he is an important one at the leaving party. The family arrive at their new bleak home and even the mother is unaware of the real nature of her husbands work. Bruno can see what he thinks is a farm from his bedroom window but doesn’t understand why the children there wear pyjamas all the time. Though forbidden, Bruno sneaks out of the back garden and finds a boy behind barbed wire. He befriends the boy despite not understanding why they can’t play. At home, Bruno begins lessons with his sister and learns about the Jews and things start to add up. Ultimately, Bruno breaks into the camp to help his friend find his father, with dire consequences. The fascinating thing about this film is that we discover things as it progresses but only when Bruno finds them. We smile as he asks why Jewish doctor practiced medicine and then gave it up for peeling potatoes. We’re shocked when the mother finds out what the smoke is coming from the camp, the propaganda film painting an idealistic view of the camp and then the truth as Bruno enters it. We never learn the names of the parents because they are always mother and father. It’s a powerful film made with a small but talented cast. What makes it special is the slow discovery through a naive child’s eyes, his reasoning and logic not jaded by experience. The sets are also small and effective. It has made me want to read the book.